Abu Abdullah Muhammad al-Harithi al-Baghdadi, known as al-Shaykh al-Mufid (d. 413/1022) is one of the foremost figures of Shi‘a history. A student of Ibn Babuyah al-Qummi – the great teacher of jurisprudence, the science of traditions (hadith) and theology in the 4th/10th century – Shaykh al-Mufid was in turn the teacher of celebrated Shi‘a theologians such as al-Shaykh al-Murtada. The author of some 170 treatises concerned almost completely with theology, jurisprudence and hadith, Shaykh al-Mufid soon became one of the main figures of the Shi‘a scholarly tradition, and his works came to occupy a privileged position in the traditional schools of Shi‘a learning. Over the centuries his writings have continued to enjoy great prominence in scholarly circles and also popularity. To this day his writings remain – along with those of his teacher Ibn Babuyah, al-Kulayni, and Shaykh Muhammad al-Tusi – the core of the theological and juridical curricula of Shi‘a seminaries. Many years ago, the Muhammadi Trust entrusted the late Dr Ian Keith Anderson Howard, a distinguished scholar of Islamic studies, with the task of translating The Battle of the Camel. 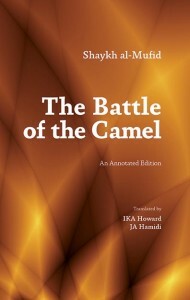 The Trust had earlier assigned two works to be translated by Dr Howard: Shaykh al-Mufid’s The Book of Guidance and Sulayman Kattani’s work entitled Imam Ali: A Beacon of Courage. The two titles are among the most important works that the Trust has published in its four decades of existence. The Trust is deeply indebted to the late Dr Howard for his contribution to the Shi‘a scholarship. Over the past three years, the incomplete manuscript of the late Dr Howard has been edited and further annotated by Mr Hamidi. Because Mr Hamidi was privileged to have access to the most recent edition of the original in Arabic, he proceeded to translate sections that were left out in the Dr Howard’s version. It is of note that the first 20 annotations were written by the late Dr Howard.